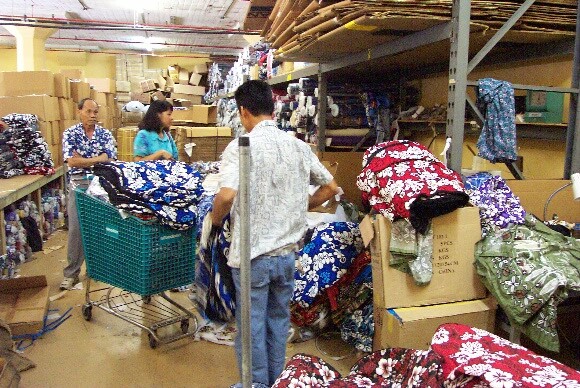 The process of making Hawaii shirts, muumuu dresses, Hawaiian car seat covers and other Hawaii Apparel to satisfy a strong demand for "Made in Hawaii" apparel and products keeps producers in Hawaii very busy. Hawaiian Apparel items have grown in popularity since World War II when our men in uniform took a liking to Hawaii shirts and brought some home after a stop over in the Islands. Today the process of making a lot of this apparel starts by laying down as much as 100 sheets or more of fabric to be cut out from a pattern to make the individual parts that make up a lot of our apparel. 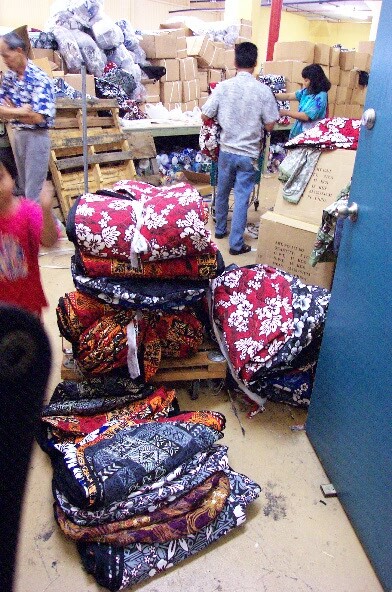 They are then machine and hand sewn into the products we offer you through our website at www.rainbowhawaii.com and through other channels. 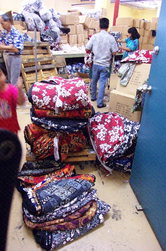 Although we are a small mom and pop operation on average we handle and ship out around 40 shirts dresses and gift items a day but when it gets busy we can and have handled as much as 1500 items in a mailing day. Although we could grow into a bigger operation we have chosen to keep this busniess small and simple as we can provide better customer service and still have fun at what we do. The fabric is rolled out onto cutting tables. A pattern is positioned over the fabric sheets and the sections are cut out. At the end of a long day we all need a break.